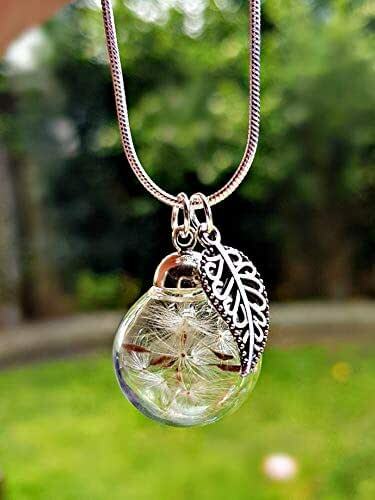 Dandelion Leaf Pendant by THE WISH CO. - Now with new and improved Sterling Silver Snake Chain! 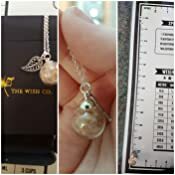 -925 Sterling Silver plated Snake chain - 22"
Glass sphere (20 mm) contains real dandelion seeds - super strength NO-BREAK glass! 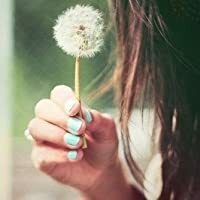 Sold by ZuZu871 and Fulfilled by Amazon. Gift-wrap available. Please complete the required customizations. More By Dandelion Wish Co. Wish it was bigger but still such a beautiful item. Came on time,Lovely packagin. Thank You . Came cracked probably transport was offered another one, free of charge thankyou. 3.0 out of 5 stars3stars. Bought this as Christmas present. When opened it wasn’t sealed properly so the dandelions fell out. Very disappointed. Looks good, not for myself but for friend. Swift delivery. Lovely and most unusual. Quality gift.